See the red marker? That's where our hotel was. See mile marker 6 on the route? That's right around where the restaurant was that we ate at the night before the race. As we were running and realizing that we were approaching the restaurant, both CC and I couldn't believe it. She said to me "It took a long time to get there last night and we DROVE!" - and that's when it hit me just how far away from the finish line we were. Understatement of the week, but dang...13 miles is far! Looking back, I think the reason why I ran out of energy during the latter part of the half was because I expended too much the day before. What I should have done was run the 5K (because it was great fun), but not walked the nearly mile to breakfast...and the mile back. And for the expo, I did a lot of walking there - I wish I had the nerve to rent one of those carts like they have at grocery stores, and scooted my way through the expo. Think anyone would have given me a funny look? Probably, but I bet people would also be jealous of my ride. Who knows - this may be the next big thing at race expos...leg-saving scooters! You heard it here first, folks. I was amazed at the amount of race officials, volunteers, police officers, and spectators on the course during the half marathon. I've never seen such a well-supported race! It felt like the entire city was there, and everyone was so, so friendly. Oh, and the aid stations were awesome, as well. Most of the people handing out cups of water or Gatorade were wearing official race volunteer rain jackets - not because it was raining, but because that is a job where splashing happens. I thought it was great that the race committee took care of their volunteers by providing those jackets...it's that kind of thought that makes a long day a little more comfortable. The Houston marathon/half marathon has been happening for over 40 years, and it's evident that not only do they have it together when it comes to putting on a great race, but that the citizens of Houston support the race, too. 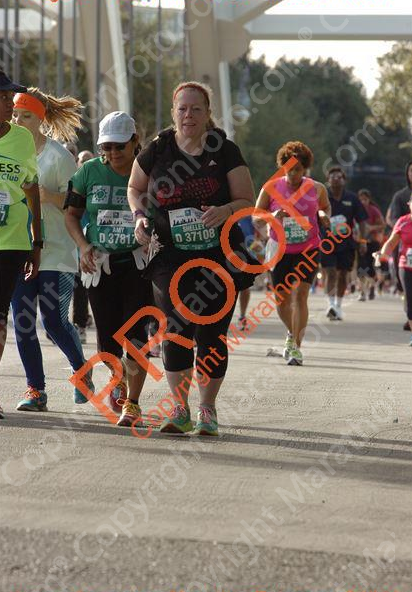 The other neat thing about the half marathon was seeing a different Houston. Even though I live fairly close (about an hour and a half away), I haven't been there very often...and wasn't impressed with what I've seen. Mostly because I'm usually on the freeway, and let me tell you, Houston freeways are SCARY - and I've lived in and driven on Southern California freeways! Plus there is a lot of industry just off the freeways; never a very pretty sight. 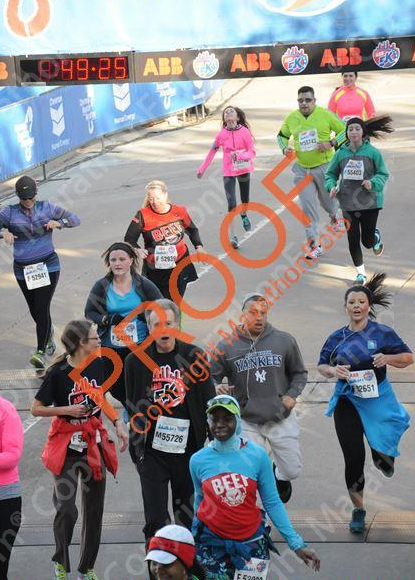 But where we ran for the half was really nice! We saw lots of upscale shopping areas, and then we ran through some amazing neighborhoods with beautiful houses on huge lots with trees that shaded the entire road. We ran by the Contemporary Arts Museum, which was a lovely area, and then we ran on Montrose Blvd, where there were lots of eclectic eateries, shops and housing (and a ton of spectators). I was impressed from start to finish - Houston, it's much nicer than I realized! Coming in for the finish - last push, but still standing tall (and smiling). On a bridge, saw the photographer, couldn't even muster up a smile. Yep, that's running for you. The great thing about google maps is that I could look up some of the streets where you ran and through street view see how it looks, gives me an idea of where you ran. Okay you may look tired but who cares: you ran 13 miles and you finished! Something to be proud of. You're making me laugh... how you're feeling (and thinking and thinking) about this race is how I was after my first Marine Corps Marathon. Houston is probably going to be the race you love the most and tell everyone to run! 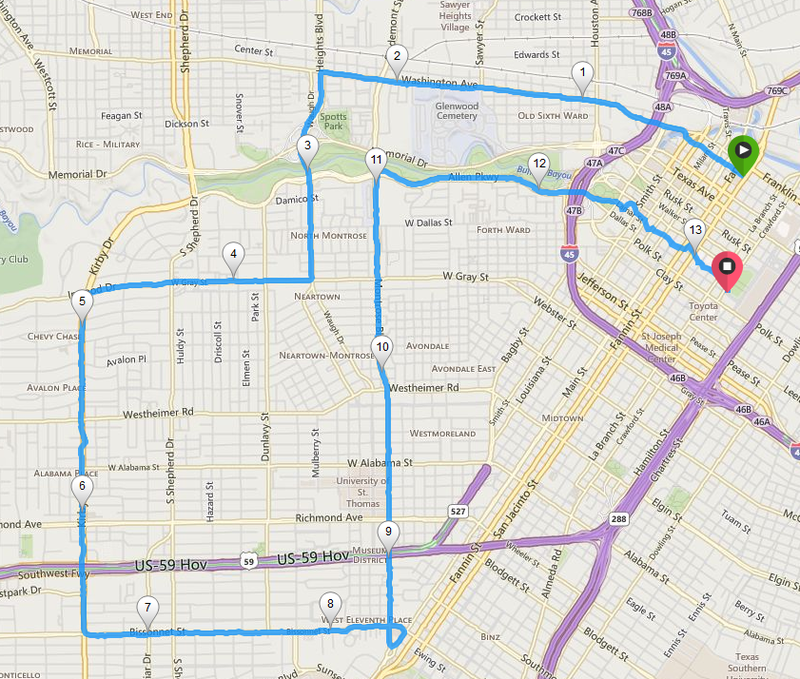 I love the half route, and I'm very familiar with Houston. I had an aunt who lived off of West Alabama which we crossed along the route. I don't think it's so much the scenery for me, just the people out cheering. FYI for next year....do the Expo on Friday - lot less crowded and gives the legs a day of "rest" on Saturday. Glad it was a great experience for you! Great idea on doing the Expo on Friday. That would make a lot of difference right there! I like your random thoughts, and was especially interested in your thoughts about Houston itself, since I had the same opinion of it as you (only been there once or twice for a dog show.) Since I am coming to the big quilt show in Houston this fall, that is nice to hear! I think that moment that the pic snapped, you may have looked tired, but you also look fit, determined and I see nothing but inspiration!!! Hugs! Take a well-deserved rest this weekend Shelley. I love the photos & who cares if you look kinda pooped .....you worked hard to earn that look!! 13 miles *is* a long race! and it isn't half anything. True, true...and my last mile was much faster than I thought it would be, considering how I felt like I was barely making any forward progress! Are you kidding me? I see grit, determination, and accomplishment in that photo, and it looks gorgeous on you.